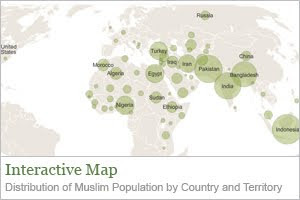 Key findings of Mapping the Global Muslim Population, from the Pew Forum on Religion and Public Life, offer the most up-to-date and fully sourced estimates of the size and distribution of the worldwide Muslim population, including sectarian identity. A comprehensive demographic study of more than 200 countries finds that there are 1.57 billion Muslims of all ages living in the world today, representing 23% of an estimated 2009 world population of 6.8 billion. While Muslims are found on all five inhabited continents, more than 60% of the global Muslim population is in Asia and about 20% is in the Middle East and North Africa. However, the Middle East-North Africa region has the highest percentage of Muslim-majority countries. Indeed, more than half of the 20 countries and territories1 in that region have populations that are approximately 95% Muslim or greater. More than 300 million Muslims, or one-fifth of the world's Muslim population, live in countries where Islam is not the majority religion. These minority Muslim populations are often quite large. India, for example, has the third-largest population of Muslims worldwide. China has more Muslims than Syria, while Russia is home to more Muslims than Jordan and Libya combined. Of the total Muslim population, 10-13% are Shia Muslims and 87-90% are Sunni Muslims. Most Shias (between 68% and 80%) live in just four countries: Iran, Pakistan, India and Iraq"
"The Pew Forum on Religion & Public Life, launched in 2001, seeks to promote a deeper understanding of issues at the intersection of religion and public affairs. The Forum pursues its mission by delivering timely, impartial information to national opinion leaders, including government officials and journalists. As a nonpartisan, non-advocacy organization, the Forum does not take positions on policy debates. The Forum functions as both an information clearinghouse and a town hall. As a clearinghouse it tracks and aggregates news and conducts independent research, including surveys, legal backgrounders, reports, books and Q&A interviews. As a town hall, it provides a neutral venue for discussion. In these roles, the Forum serves as an important information resource for political leaders, journalists, scholars and public interest groups. Based in Washington, D.C., the Forum is directed by Luis Lugo. The Forum is a project of the Pew Research Center, a nonpartisan "fact tank" that provides information on the issues, attitudes and trends shaping America and the world. The Center is a subsidiary of The Pew Charitable Trusts."